naturespacecreative was the brainchild of Nicola Mclaughlin , Joanna and Tanya Knight in order to develop an organisation that could have the aim of working with all ages and abilities in order to " Empower responses to the environment ( built, urban or rural) through the Arts and Education." Over the core first few years the following projects formed part of the naturespacecreative portfolio. naturespacecreative's work continues on a less formal basis but we are always availiable to design and collaborate projects that embrace the the natural and external environemnt to develop progression, talent and placemarking. ​A creative partnerships project that has been facilitated through naturespacecreative to create an outdoor learning space . The process has used a whole school approach from the conception of the space through to the creation of the space and has been features in the local press and national media. Journey was a participatory project co created with Joanna to explore cultural differences in different countries around the world. The piece "journey" created by individual groups in one way and another used the idea that all people in one way or another share a journey. The young people were asked to reflect upon a poem created by Joanna to support there creative process and reflection. 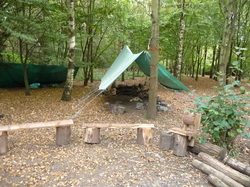 naturespaceschool uses the forest school ethos to create long term projects, led by a qualified Forest School Leader to develop the Personal Social and Emotiional development of children. Courses are bespoke to the setting and can take place in any environmental setting. Programmes have been run in woodland, on open school grounds and on beaches. ​A bespoke workshop and experiential day for BA students based at Yorkshire Sculpture Park to explore response to space and landscape and explore responses by Artists. This was a project comissioned by the Early Years team at a local authority to explre "Every Child a talker" The piece ( in creation in the photgraph) incorporated the children to collect natural materials to create a very Hungry Caterpillar. The session incorporated activites for over 150 children over the course of the day, and on one of the coldest and challenging weather days of the winter. naturespacecreative was asked to support the CPD of teachers the Learning Outside the Classroom element of using art within the school grounds to link to curriculum. 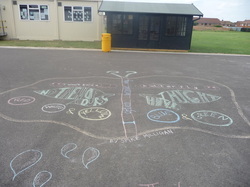 The picture shown is of an activity to explore poetry through use of visual stimuli.